Hurricanes. Living in the Keys, I always knew this was a part of my reality. But, I had escaped a real pounding from this particular part of Mother Nature for my whole life. That ended September 10. My family and I made out better than most, and worse than some after Hurricane Irma. My husband Dave and I have an infant son, so we took no chances. We left days ahead of the storm, driving 32 hours straight to my in-laws’ house in St. Louis. Once there, we waited anxiously on any word about our house. I will not go into the evacuation excursion, but we were anxious to get back. When that day finally, came it was clear that the laid back, fishing on the weekends, drinks with the neighbors, and cook your catch cook outs were not going to be happening soon. Everyone had work to do, and that will continue for years. 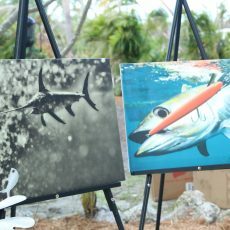 Four months after Hurricane Irma, the three-day fundraiser, Fish for Jose 2018 (FFJ), came at the perfect time. Homes were livable for most of those who live here. The fishing was picking up, and you wouldn’t get a flat tire 1 out of 5 times while driving. The Keys were open for business, but it was clear the clean up was more of a marathon than a sprint. Without getting political, people have begun to take it upon themselves to clean up our roads, mangroves, canals, and coastlines. 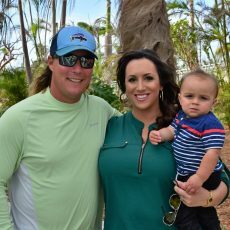 Costa’s Fish For Jose Kickoff Party at the Square Grouper’s My New Joint was a hit. The Square Grouper, or the “Grouper” as locals call it, doesn’t disappoint. The Grouper was hands down my father’s favorite restaurant, and they even named a room in his honor. Costa always knows how to get the party started, and the Grouper is the place to do it. 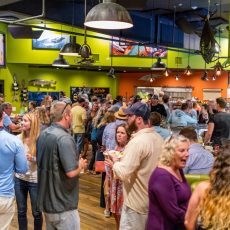 Since Irma, people have needed a fun weekend … a weekend of specialty Tito’s cocktails … of giving back and with a few prizes along the way. Keys born and bred Rob Torres even brews his “Spanish Fly IPA” beer for the weekend. 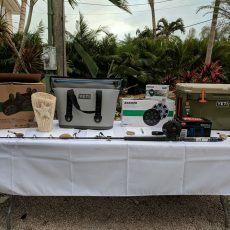 Many of the raffle items went to people that lost that item during the storm. Yetis floated away, and boats sunk. The dollars spent on just getting your boat to where it was usable again was costly, let alone other accessories that go with it. It was nice to see Raymarine and PowerPole products go to people that lost theirs in the storm. Every prize seemed to find the right home. Jason and Dee Dee lost the walls in their bedroom. Their dresser, pictures, shoes, and decorations were gone. Wouldn’t you know it that they won a pair of Ola Kais, a canvas print from Kevin Dodge, a pair of Costas, and some Columbia gear. The next day was our Spanish Fly Backyard Dinner. Lenore (one of the best humans I know), my husband Dave, long time friend and musician Terry Cassidy, and the Parrotheads worked on getting the back yard set up for dinner. Up front, Jenn Holeman (our secretary) and Debbi (treasurer and my “adulating mom”) held down the fort. It was a bit breezy (30 knots), but as long as it didn’t rain we were all good. Costa also helped sponsor a very needed canal clean up. They generously donated supplies to volunteers, brought their own volunteers, and giveaways. While halfway in the mangroves I started to find baby bibs, pacifiers, and bottles. Being a new mom, this hit me pretty hard. Someone with a new baby has lost everything, or at the very least their entire kitchen. It wasn’t just trash that we were picking up. It’s parts of people’s lives, and that’s what is really sad. I had to break away to pick up some pizza from Pizza Works to pass out to the volunteers, and then head home. It’s always nice to see something you’ve been planning come into fruition. The backyard looked beautiful. If you watched Spanish Fly over the years, 90% of the interview scenes were shot somewhere in his yard. After the hurricane, we lost a lot of trees, the boardwalk, dock, and tiki huts. My husband and friends finished everything just in time. During dinner, it was my time to go up and speak about what we’ve done since last year. 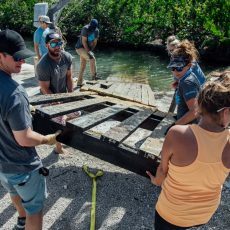 We’ve continued to make fishing dreams come true for individuals with life impacting challenges, and have also participated in the clean up efforts by housing volunteers, buying supplies, and sponsoring the first “Keys Giving”. We are starting to work with other community organizations to get those who were heavily impacted by Irma out on the water. We also had two very special guests. Edwin and Christian, who were both recipients from the Foundation, were speaking. Edwin is a Marine veteran, and Christian is a 16-year-old who has a brain tumor. For Edwin (and I’m sure many other Marines can relate), speaking in front of people about what he has gone through is not easy. He went up there and spoke like a pro. I cried most of the time because I have seen him grow in so many ways from when we first met. Our veterans and I will joke about getting the “feelz” sometimes. Translate that to getting emotional or choked up. When Edwin said, “Not many people can continue to save lives when they die. Before my trip to the Keys I was in a very dark place. Jose saved my life.” Yup, that got me. Steve Miller, radio DJ and auctioneer, went up to start our first round of auction items. He knows how to get the crowd going. Fishing trips with Carter Andrews, TJ Ott, signed Jose pictures, Bote Boards, LIVE boards, Decked Truck Beds, custom Yetis with a custom Spanish Fly SeaDek, custom Spanish Fly rods, and reels. You name it! It was a fisherman’s paradise. Next speaker was Christian Waymire. Here’s a kid who really knows what matters … health and family. Christian has had three different brain surgeries, and a stroke leaving him with an excessive tremor on the left side of his body. He cannot play basketball or the violin like he used to. He does not care what “normal” high school kids care about. He sees the value in family and humanity. He is wise beyond his years, and one of the sweetest people I know. While he was on his trip down here, we were on the boat and I looked over and noticed his tremor was far less violent. I didn’t mention anything, but he brought it up during his speech. Even though our islands were devastated, he never feels more relaxed than when he is here. 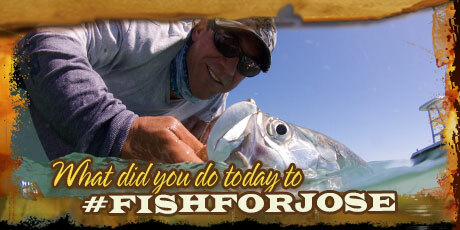 Former client and forever friend Stephen Weitzen went up to share a few of his favorite fishing with Jose stories. 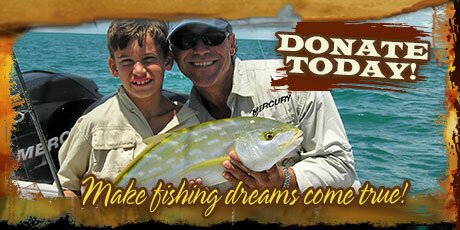 Stephen works for Seigler reels, and has helped immensely in raising funds. I will be sure to share those stories soon. I went up one more time. First part was to thank all of our major donors. Shimano and my father grew up in the saltwater fishing industry. They are our largest annual donor at the Legacy level. Long time friend of my father’s and President of Shimano North America, Dave Pfeiffer, was one of the founders of the Foundation. If you’re lucky in life you have that one friend who is like a brother. That’s the relationship that Dave and Jose had, and because of that brotherhood, made Shimano the gear that it is today. If you didn’t know, Costa has a pair of sunglasses named after my dad. The “Jose” style has continued to be one of the best selling pair of sunglasses. When my dad passed, the employees of Costa made it a point to let me know that they were here in any way that I needed. They made me, and everyone that works with the Foundation, feel like family. During events like these, our volunteers and Foundation recipients are able to connect with the people that work for Costa. It truly is one of the best companies to work with. Board member Tony Murphy had introduced me to one of his clients, Warren Waugh. 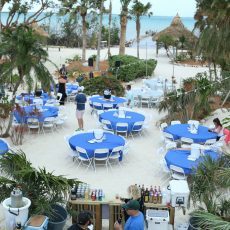 Warren had started coming to the Keys after watching Spanish Fly. 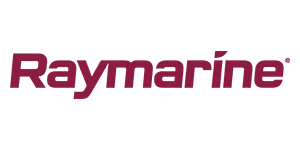 Lyon Waugh Auto Group is our first non-fishing related Headline sponsor, but is the perfect example of how impactful Spanish Fly and Jose were to so many. Winters in New England can be rough, and every Sunday morning watching Jose landing wahoos, sailfish, or whatever sparked something in Warren and he has kept coming back. Not only that, but he has generously donated for the second year. Many have asked about how to watch episodes of Spanish Fly. Well, the Outdoor Channel has donated commercial time to promote the Foundation as well as putting it on their pay-to-watch streaming network, www.myoutdoortv.com. 59 episodes are up with more to come. Tito’s Vodka is one of the most philanthropic alcohol companies out there. When I first met John, who works for Titos, I told them about the Foundation. He simply said, “If it’s in honor of your dad we are all in.” And they are. Raymarine has been a part of the team at the annual Visionary level, and Landed level for FFJ since the Foundation started. They have always offered their help, and followed through with every commitment. Ever hear of the show Wicked Tuna? Well if you haven’t you’ve probably been living under a rock. 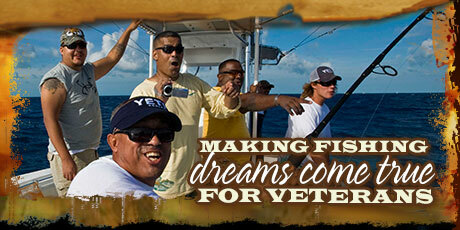 Hot Tuna with Captain TJ Ott has donated the past two years at the Leadered level. Not only do they donate trips and money, but they are constantly promoting the Foundation which we appreciate. Yeti and SeaDek come together every year to make one-of-a-kind Spanish Fly Yetis. 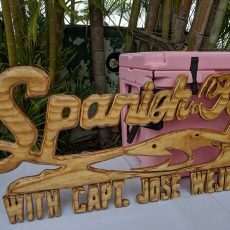 If you come to one of our events, you might even get a custom Spanish Fly rambler. The initial relationship between Yeti and Jose started with Flip Pallot, and Yeti has been kind enough to continue that partnership. 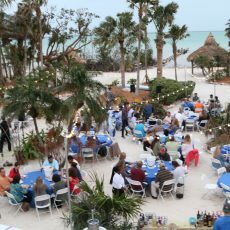 The weekend ended with our wrap party at Saltwater Angler in Key West. It’s always nice to recap the weekend with everyone. We got feedback on what we did right and what we can work on. Looking forward to next year!